After you have familiarized yourself with the basics of creating dynamic content, take a look at some of the examples below. These are basic scenarios meant to help you start thinking about ways in which you can get creative with dynamic content. Certain email domains can route your marketing emails into a junk or secondary folder unless a key term exists in the subject line. This can impact first-look customer opportunities. 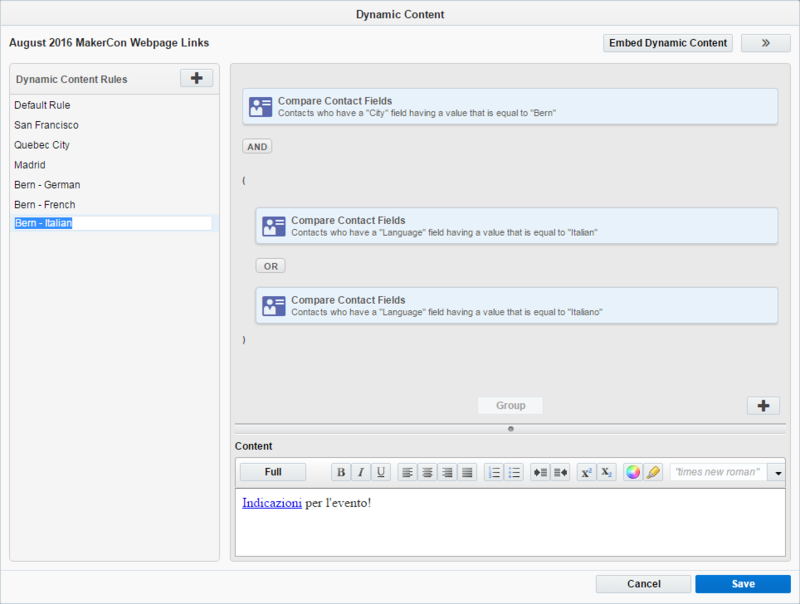 Use dynamic content to prepend (or append) a key word or phrase in your subject line, which will appear only for a specific email address or domain. Leave the default rule blank, so that the keyword only populates in desired emails. 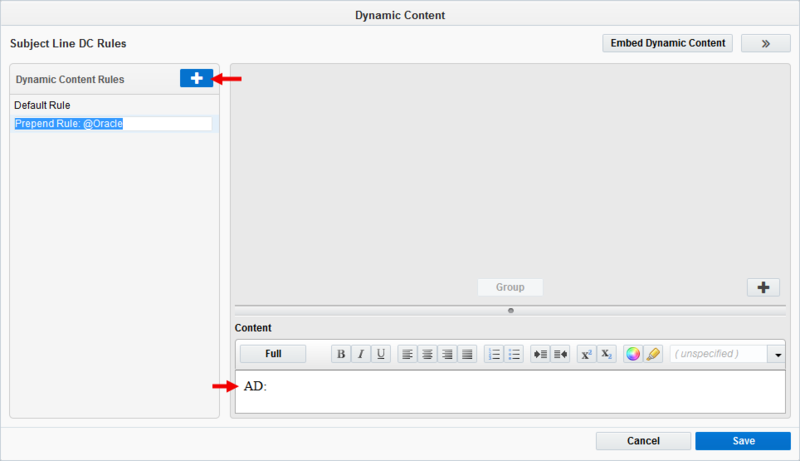 Click the Add Rule button in the left pane, then write your content in the editor. 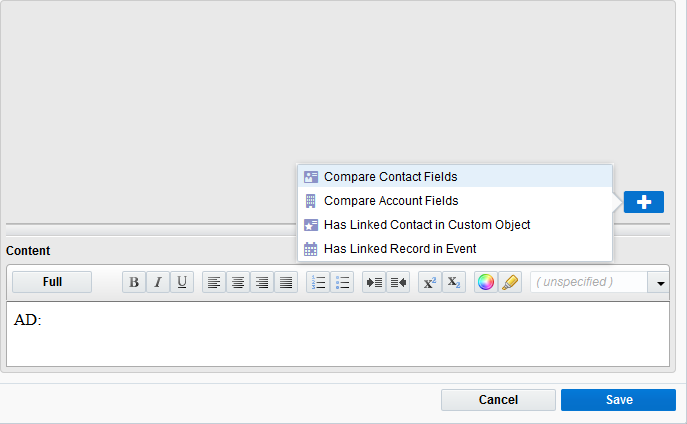 Click the Add Criteria button in the right pane, then select the Compare Contact Fields. Configure the rule criteria it so that the rule applies to a specific email domain, then click Save. (Optional) Configure additional rule criteria (if applicable), or add extra rules. Click to open the Settings panel then click Insert and select Dynamic Content. Search for the item and then double-click the item you want to add. Add any additional text to the subject line. Edit, save, and send your email when you are ready. Alternative content will populate the subject line, but only for the specified addresses. 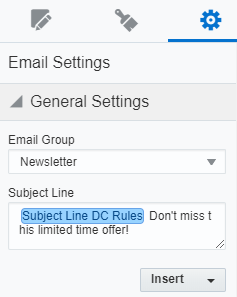 Tip: Create entire subject lines as dynamic content, and configure the content rules so that a different subject line displays based on a contact's job, city, or other relevant contact or custom object information. 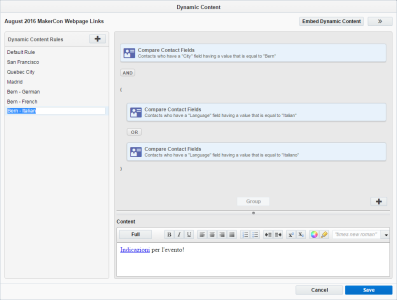 You can also use dynamic content in conjunction with a field merge to further personalize the subject line. When hosting similar events across multiple cities or countries, provide attendees with details (time, location, directions) for the event nearest to them. From a single confirmation email, you can send Swiss contacts a link to a web page for the event in Bern, while attendees in the United States will receive a link to the San Francisco event web page, and so on. Click the Add Rule button in the left pane, write your content, and then click Full. 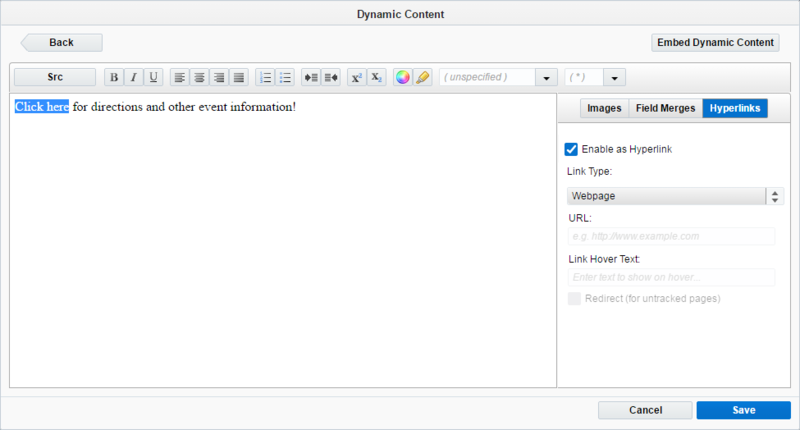 Click the Hyperlinks tab, highlight your text, then select the Enable as Hyperlink option. Type the link to the region-specific web page in the URL field, then click Back to return to the rule list. Click the Add criteria button in the right pane, then select the Compare Contact Fields rule criteria. Configure the rule criteria so that the rule applies to the specific city, zip code, or country, then click Save. Repeat steps 1 through 5 to add rules for each event, and add links to the appropriate page in each rule. Tip: Set rules for a specific language when hosting an event in a region with more than one dominant language. You can configure separate rules for the same location, and filter for the preferred language (as indicated in the respective contact field). (Optional) If you anticipate that some email recipients will lack the field values to trigger a rule, consider adding content to your default rule. Link users to a form where those recipients can provide their information before receiving the proper event information. Alternatively, link users to a web page with links to region-specific events. 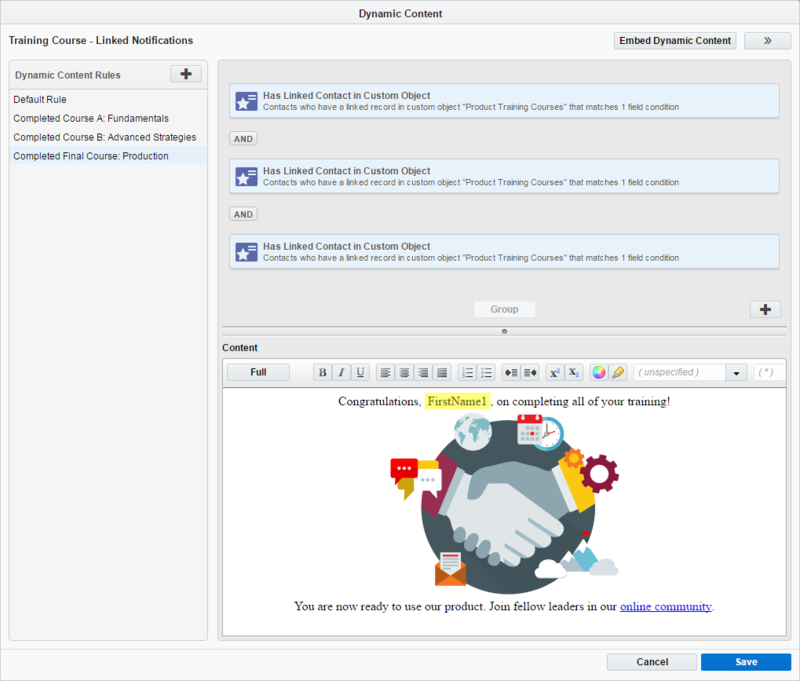 Click Save, then add the dynamic content to your email. Event attendees will receive information that is relevant only to them. Tailor your emails with content relevant to an account (company), and pique interest for recipients who work in that company. For this scenario, we'll add a hyperlinked image to accompany an email for furniture resale. If the contact is linked to a company that specializes in a particular type of furniture, then the unique image will link to a section of your website featuring that type of furniture. Click the Add Rule button in the left pane, then click Full. Add your text, images, field merges, and hyperlinks as needed, then click Back. Click the Add Criteria button in the right pane, then select Compare Account Fields. Set the criteria to filter for a matching Company Name account field. 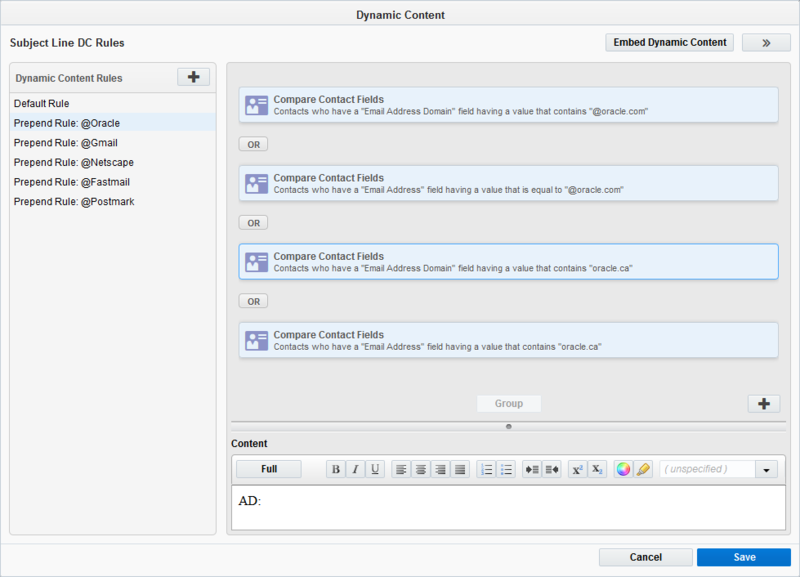 If the contact is properly linked to a account with that contact field, the rule will apply, and the contact will see the unique content for this rule. Repeat steps 1 through 4 to add more rules, each with their own hyperlinked content, then click Save. In your email editor, click Dynamic Content and drag the content directly onto the text field (or source code). Learn more about adding dynamic content to an email. (Optional) Provide a generic version of your content for the default rule. Your hyperlinked image would instead link to the main page of your catalog, where visitors would browse for the type of furniture relevant to them. Recipients linked to an account will see information relevant to employment in that company. Tip: If you have an established relationship with that company as a client, you might also include content such as links to company-specific offers and discounts. 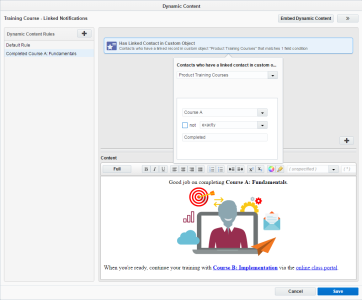 Notify clients about training courses that you're hosting online, using custom object field information to identify which courses they have already completed. You can also promote your training courses to new users, as well as send a congratulations for users who have completed everything. With the default rule selected, click Full. Add images or text advertising your online training courses. For instance, "Head over to our online class portal to enroll in Course A: Fundamentals, and get started on your path to becoming a subject-matter expert!" Important: Be sure to provide at least one hyperlinked object that leads to the main page where new users can access your courses. Click Back to return to the rule editor. Add a new rule and tailor the content for users that have completed the first training course. Click the Add Rule button in the left pane, then click Full to open the full content editor. Add images or text advertising your online training courses. Example: "Good job on completing Course A: Fundamentals. When you're ready, continue your training with Course B: Implementation via the online class portal" where "online class portal" links to the main course listing, and "Course B" links to the specific source. 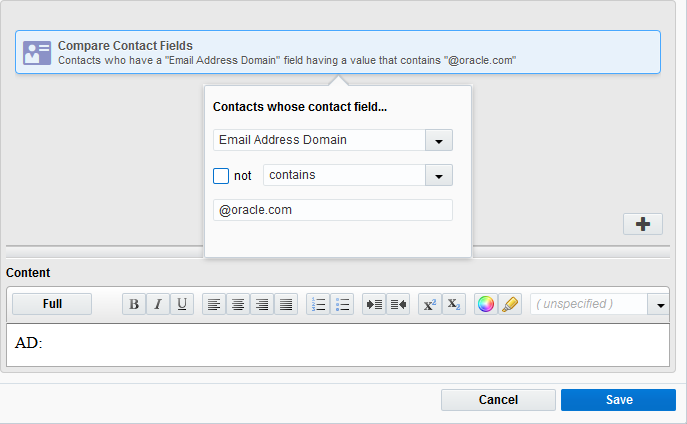 Click the Add Criteria button in the right pane, then select Has Linked Contact in Custom Object. 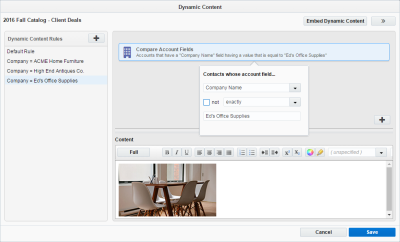 Select the appropriate custom object and a custom object field. Then set the criteria so that the rule will apply when that field indicates that the linked contact has completed the course. Repeat step 2 and add rules and content for every level of course completion. Add a final rule with congratulatory message for completing all courses, and then click Save. 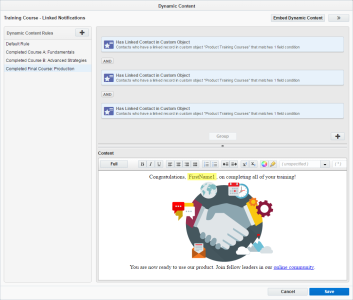 Insert your content to an email, and use that email in a multi-step campaign.